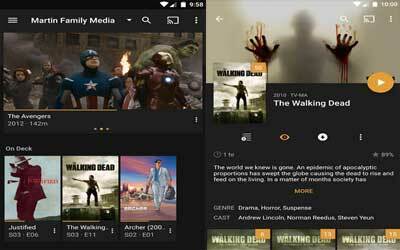 This is old version Plex 4.29.1.7 apk for Android, you can install it if you want to downgrade or install old app. It is top Media & Video apps from Plex, Inc..
Plex also shows great features in displaying the content with sleek interface and rich metadata and lyrics provider in music player and decent sound quality. Another good feature is Offline mode where users can save online content into offline one as long as it does not violate copyright or store them to cloud provider including Google Drive. Watch Later feature lets user to bookmark certain content to be watched later. All of Plex awesomeness apparently has to be restricted in Free version. Those who do not desire for paid application may find this a little disappointing. It restricts playing media like music and video for one minute only. In older version, application frequently crash, and it is not very convenient for phone with low memory. In order to get all the features, users have to get Pass. However, once users purchase or get Pass, thr features are really worth for paid application. Fix crash on startup for users that had played something under a relayed connection with version 4.28 of the app.